Úna Fitzpatrick from the National Biodiversity Centre will be giving an update on the Ireland Pollinator plan at 2pm on Saturday 10th February. The venue is the NIHBS conference, Athlone Springs Hotel. Úna has a Ph.D. in Botany. 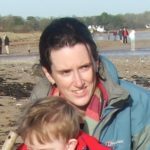 She worked on a project on the conservation of Irish bees before joining the National Biodiversity Data Centre in 2007 where she has responsibility for plant and pollinator databases. She is the chair of the steering group that produced the All-Ireland Pollinator Plan 2015-2020 and oversees its implementation.